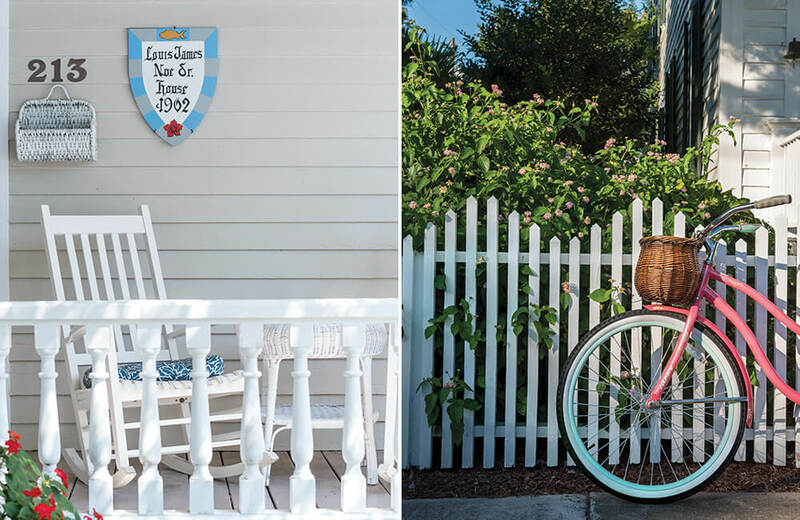 A coastal town with an abundance of charm looks even sweeter aboard an old-school beach cruiser. 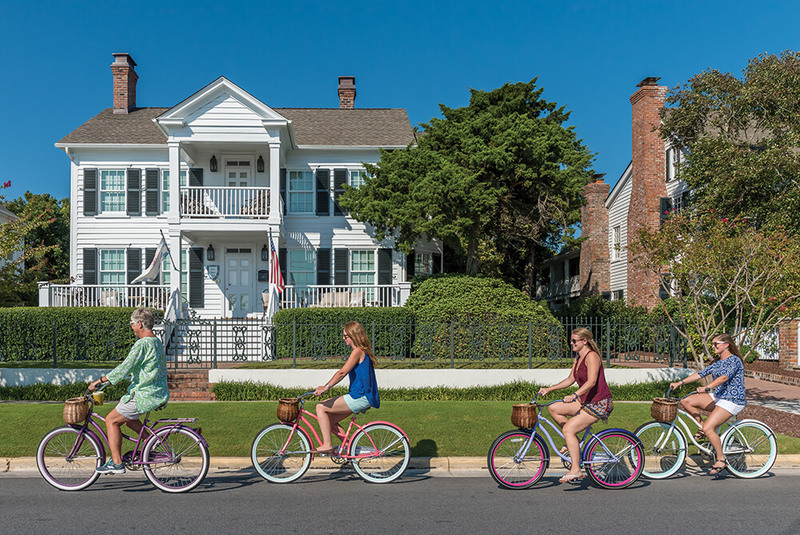 Feature image, above: When they’re working inside the Hungry Town welcome center and they hear a passerby singing “Scarborough Fair,” owners David and Betsy Cartier know that someone’s spotted their bikes parked outside on the boardwalk. 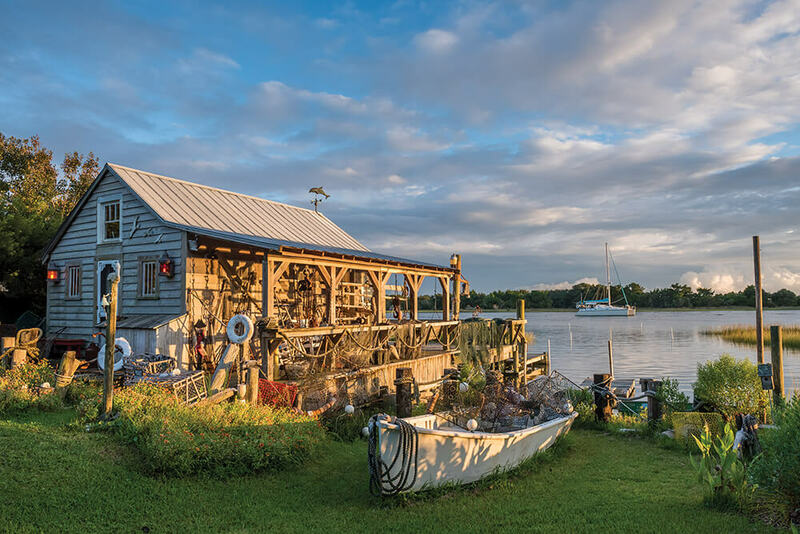 In Beaufort, all roads lead to the water — with plenty to see, smell, and taste along the way. Which makes a leisurely bike ride the ideal way to get to know the town. 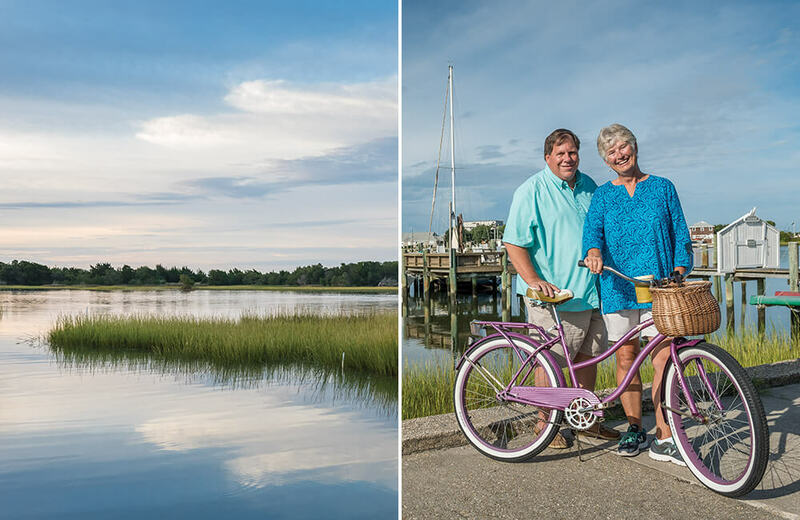 David and Betsy Cartier, owners of Hungry Town Tours, carefully plan every aspect of the 15 biking and walking tours they offer, but they know they can count on Beaufort to work its magic: the breeze coming off of Taylor’s Creek, the sunshine on your shoulders, the locals smiling and waving hello. As Betsy and her tour groups gently glide through downtown, she stops occasionally to tell stories plucked from 300 years of coastal history. But mostly, she lets the town speak for itself. Less than five minutes in Beaufort, and Betsy Cartier was hooked. Forty-five days later, she and her husband, David, natives of the Northeast and veterans of the hospitality industry, made the town their new home. Meanwhile, David found a guided tour company for sale. Hungry Town was a tiny operation then, but the Cartiers have made it blossom. 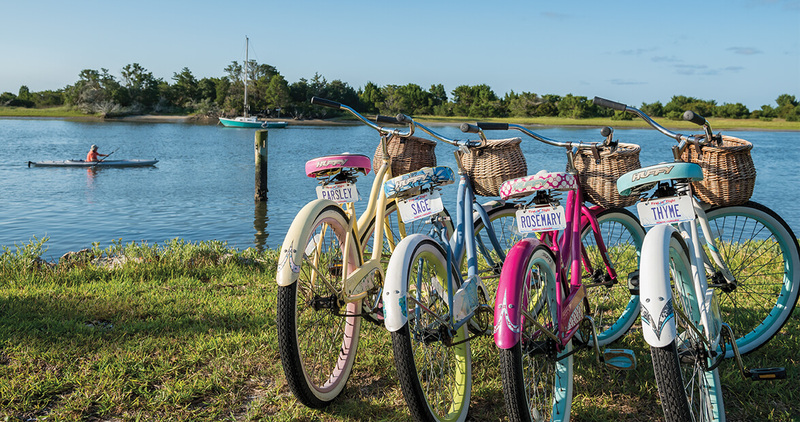 Paired with Beaufort’s flat streets, Hungry Town’s colorful bikes — Huffys, just like Betsy grew up with — make you feel like you’re cruising back into childhood. In the 1940s, friends and family of Capt. Louis Styron floated boards down Taylor’s Creek to build the fisherman and his wife, Celia, a little house on the bank. Living on the water — visible, in places, between the floorboards of the house — made Celia nervous, especially after their two children, Louis Jr. and Celia Faye, were born. So Louis built the family a new homestead across the street, and used the fish house for opening scallops, working on engines, and painting boats. 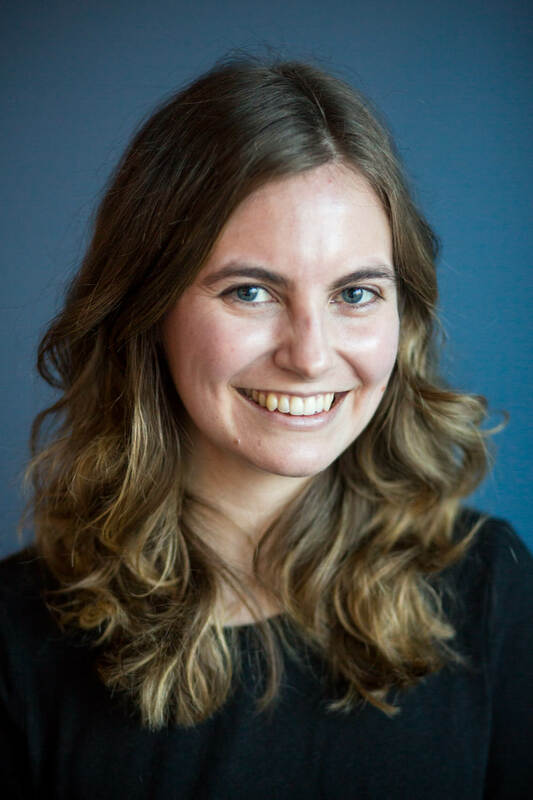 Though her parents have passed away, Celia Faye still lives across the street, and if she happens to be in the yard when Betsy and her tour groups roll by, she’ll invite them in for a look around the fish house, now filled with mementos of her family’s life on the water. 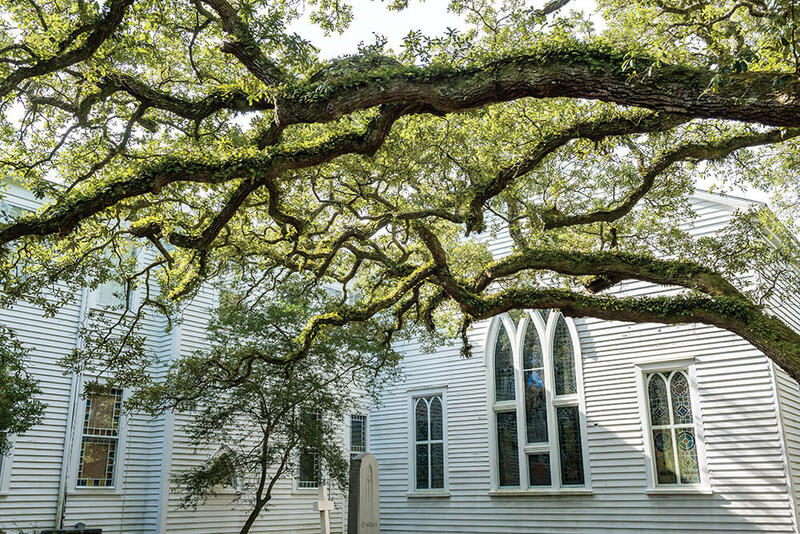 In the Old Burying Ground, the white clapboard of Ann Street United Methodist Church serves as a striking backdrop for the quiet drama that unfolds along the spreading branches of live oak trees. The limbs play host to resurrection ferns, air plants that shrivel with each drought, and unfurl, green and healthy, with each rain. Below, stones mark the graves of Revolutionary and Civil War soldiers, and naval hero Otway Burns. In this place of final rest, the resurrection fern lives. A school of brightly colored fish swims through town, on the walls of shops and restaurants. The source? Craig Gurganus, aka “The Fish Bouffant” — so named because his creations, made from the remnants of broken surfboards, puff out a bit, just like the hairdo. Craig, a native of Rocky Mount, got the idea for his fish while living in California. His earliest pieces were made of chicken wire and fiberglass, but he switched to pieces of surfboards, letting the natural shape of a remnant guide what a fish will look like, and adding fins and Ping-Pong ball eyes. 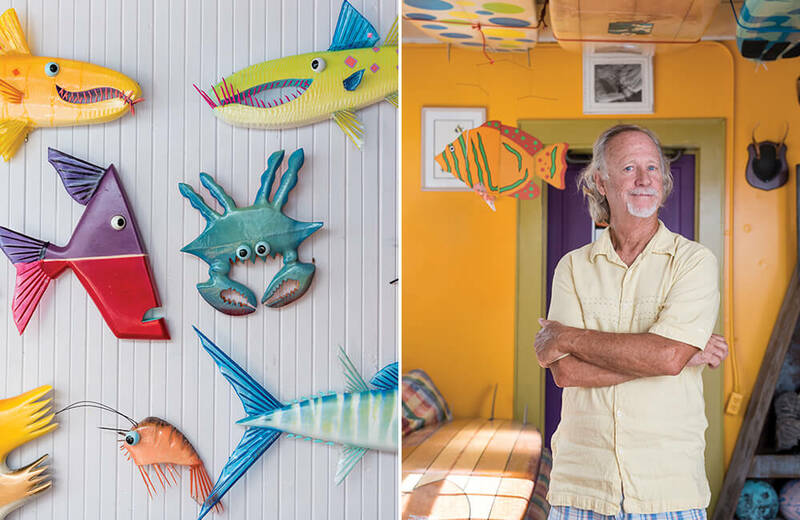 Along one wall of Craig’s house, fish, crabs, shrimp, and sharks coexist in a sea of color. 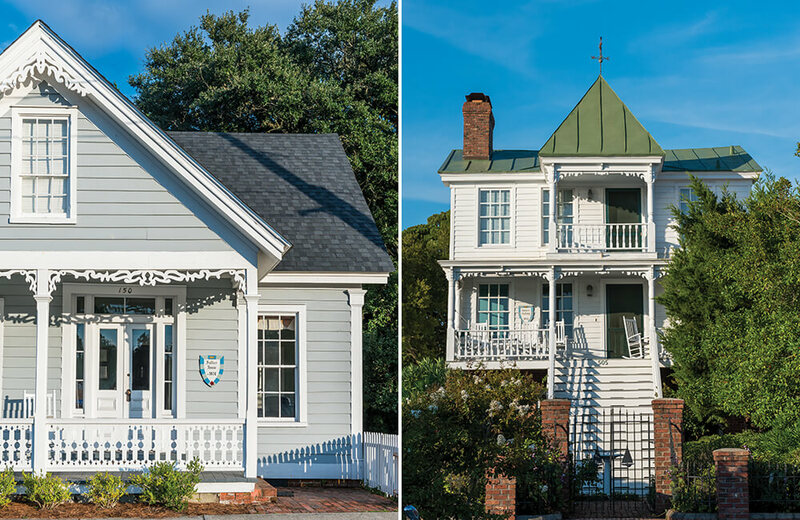 Locals wear their Beaufort pride on their houses — and around them, too. Historians connect the undulating pickets of the “Beaufort fence” to an early law requiring that pigs be kept in their owners’ yards. No one is sure why this fence contained pigs better than any other, but every theory makes for another great story. In a small town with a big reputation as a dining destination, Beaufort Grocery Company is a long-standing favorite. Owners Charles and Wendy Park had only lived in Beaufort for a few months when they decided to buy the old Owens Grocery Store. The restaurant they opened in 1991 blends Charles’s culinary training and Wendy’s pastries with the laid-back, coastal feel and fresh, local ingredients of their adopted hometown. At lunch, the “Sumpin’s Jumpin’” sandwich changes depending on the day’s catch. 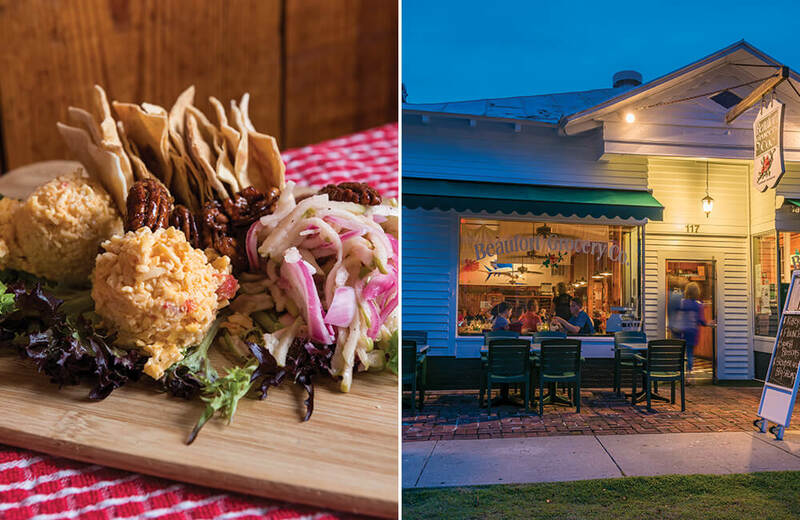 Don’t say we didn’t warn you: Once you try Beaufort Grocery’s pimento cheese, served with spiced pecans, Granny Smith apple slaw, and lavosh crackers, you may not be able to live without it. Fortunately, you can find the recipe in BeauGro’s cookbook, Closed on Tuesdays. 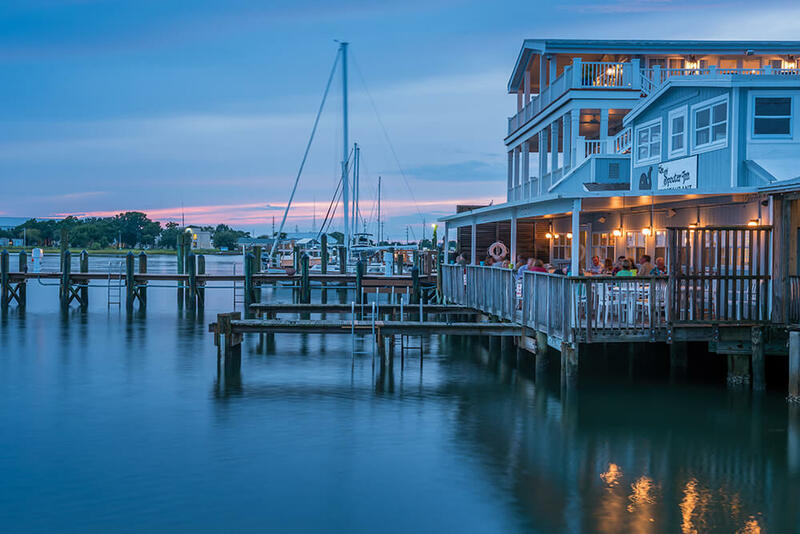 Diners head to The Spouter Inn Restaurant & Bakery as much for the local seafood and freshly baked pies and cakes as for the view from the waterfront deck. 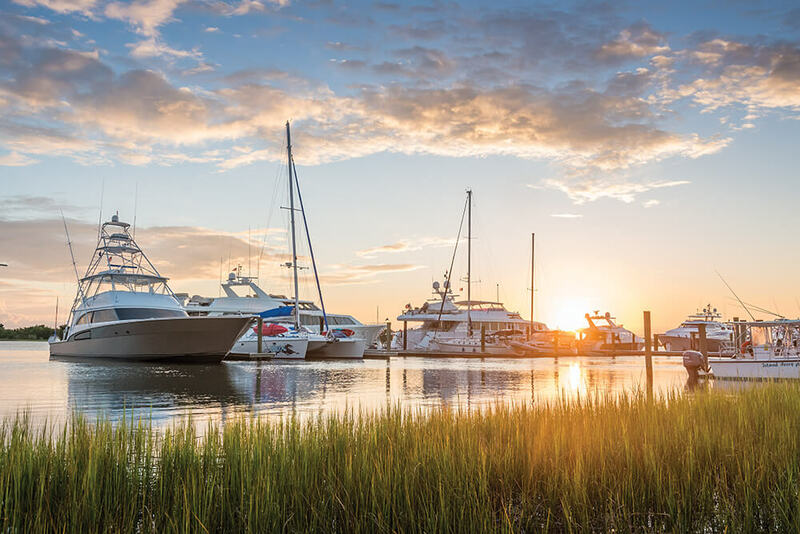 Across Taylor’s Creek, past the busy harbor, a menagerie of coastal birds and animals — egrets and herons, sea turtles and dolphins — make their home on a small complex of islands known as the Rachel Carson Reserve. Everyone keeps an eye out for the reserve’s most famous residents: wild horses. Even from a distance, the sight of these beloved creatures is enough to make you stop what you’re doing to watch them roam. The scent of fresh wood floats through the open doors of the Harvey W. Smith Watercraft Center and onto the sidewalk, inviting passersby to stop and watch the boatbuilders at work inside. 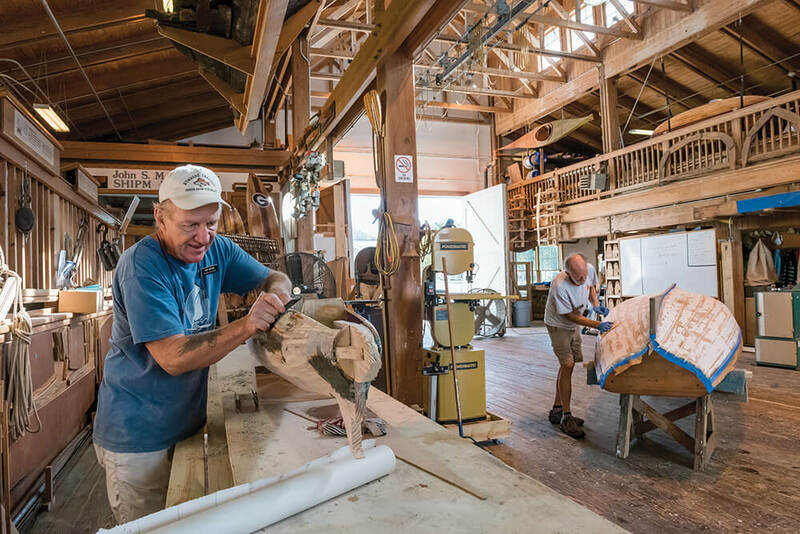 In a town where the traffic mostly consists of boats — “It’s a busy day in Beaufort if there’s activity on Taylor’s Creek,” Betsy says — the Watercraft Center, part of the North Carolina Maritime Museum, is both a fitting tribute to the state’s rich history of wooden boatbuilding, and an active workshop where volunteers like Jim Brode (pictured) preserve significant examples of the tradition. Often, the Cartiers open their tours with a Beaufort story that explains where the name of their company came from. (Although they do lead culinary tours, there’s a little more to it than that.) Hanging in their welcome center is a copy of a 1713 map of Beaufort, inscribed with “Hungry Town.” Why? Because the young town, having been established just four years before, was “hungry” for settlers. More than three centuries later, there’s always room for one more person to stroll — or pedal — along the waterfront, catch a breathtaking view of the sun setting over boats in the harbor, and fall in love.